Councillor Alex Nicoll has been left unimpressed by the council's decision not to hand out crackers at school Christmas dinners. Cash-strapped public authorities have been branded “Grinches” for taking away Christmas crackers from children to save cash. Aberdeen City Council is the latest northern council to withdraw the gifts in the expectation of saving around £1,500 a year and reducing waste. The traditional items have until now been handed out to pupils during festive lunches at schools across the city. 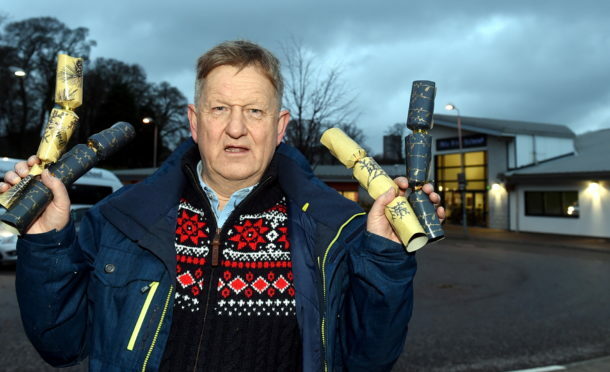 Neighbouring Aberdeenshire Council stopped handing out crackers about a decade ago, while Moray Council discontinued the practice three years ago – though neither could say how much the policy saved taxpayers. Highland council’s catering service doesn’t provide crackers but individual schools can purchase them, using their own budgets, if they so wish. Last night a north-east MSP said ever reducing council funding would leave more authorities struggling in the future. An Aberdeen City Council spokesman said: “Christmas lunch is a popular date on the school calendar and thousands of children across the city will enjoy a festive meal this year as part of the celebrations. A Highland Council spokesperson said: “Highland Council’s school catering service does not provide crackers so there is no money spent or saved from the catering budget on crackers. North-east Liberal Democrat MSP Mike Rumbles said he was disappointing by the decision but highlighted the funding issues facing Aberdeen and other councils. He said: “It is well known that Aberdeen City Council is the worst funded local authority in Scotland, followed by Aberdeenshire, which is the third worst. Aberdeen opposition SNP councillor Alex Nicoll compared the £1,500 saving to the £150,000 the authority put aside to stage this year’s Christmas village attraction. He said: “It sounds very much like the administration are playing the Grinch this year and that’s simply not on.